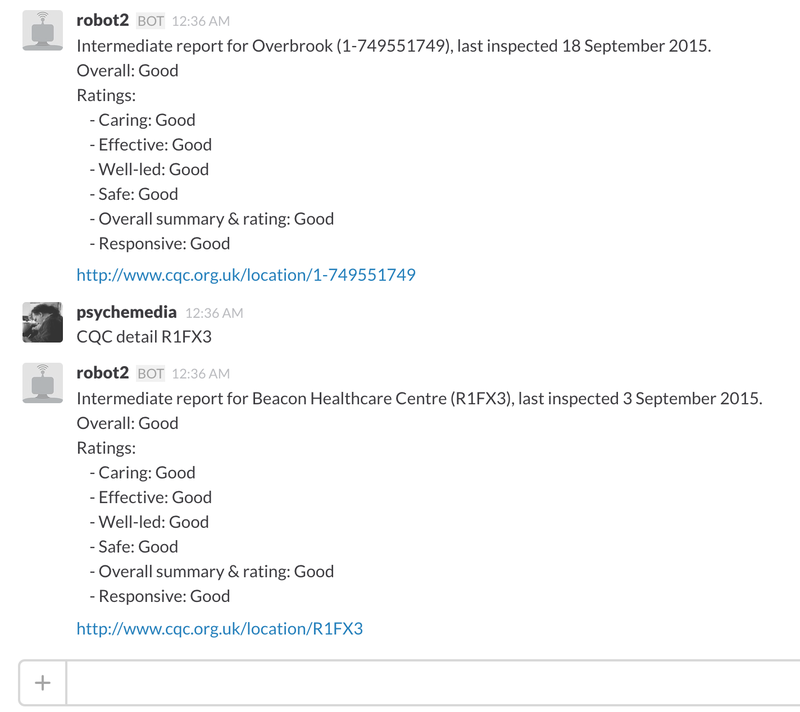 A few months ago, I started to have a play with ratings data from the CQC – the Care Quality Commission. I don’t seem to have posted the scraper tools I ended up with anywhere, but I have started playing with them again over the last couple of weeks in the context of my slackbot explorations. In particular, I’ve started working about a conversational workflow for keeping track of inspections in a particular local area. At the current time, the CQC website only seems to support alerts relating to new reports at the level of a particular location, although it is possible to get faceted search results relating to reports published over the course of the last week or last month. For the local journalist wanting to keep tabs on reports associated with local providers, this means setting up a data beat that includes checking the CQC website on a regular basis, firstly to see whether there are any new reports, and secondly to see what sort of reports they are. And as a report from OnTheWight today shows (Beacon Health Centre rated ‘Good’ by CQC), this can include good news stories as well as bad news one. As part of the report, this returns a link to the CQC website so we can inspect the full result at source. I’ve also got a scraper that pulls the full reports from the CQC site, but at the moment it’s not returning the result to slack (I think there’s a message size limit which I’m overflowing, so I need to find what that limit it and split up the response to get round it.). 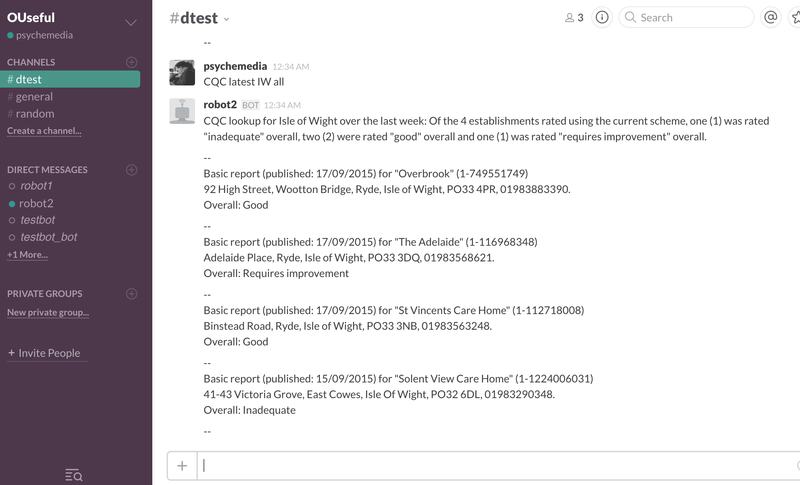 That said, slack is perhaps not the best place to return long reports? Maybe a better way would be to submit quoted report components into a draft WordPress blog post? We can also pull back administrative information regarding a location from its location ID. Company number and charity number information is available for some providers, which means it should be to trivial to ask return company registration information and company directors information from Companies House or OpenCorporates, and perhaps even data from the Charities Commission. Rather more scruffily, perhaps, we could use location name and postcode to try a search on the Food Standards Agency website to see if we can find food ratings data for establishments of interest. There might also be opportunities for linking in items from local spending data to try to capture local authority spend with a particular location or provider. This would be simplified if council payments to CQC rated establishments or providers included the CQC location or provider ID, but that’s perhaps too much to ask for. 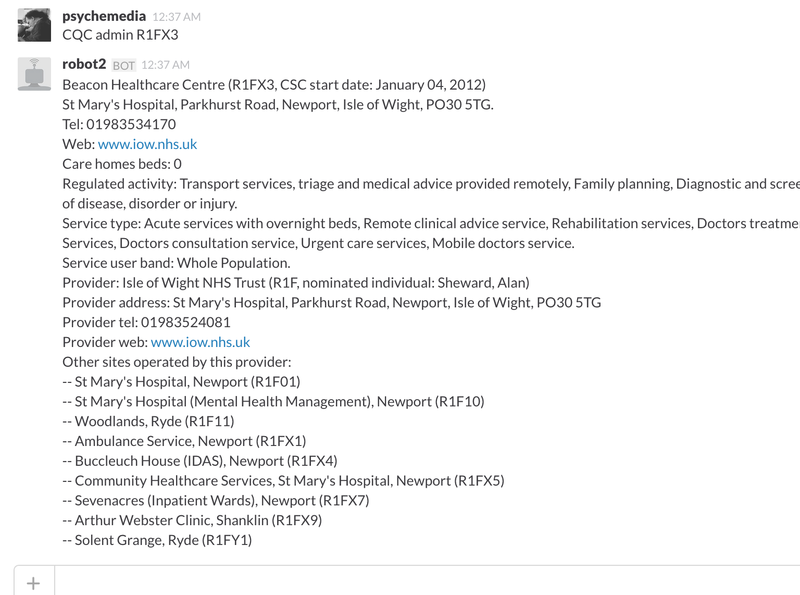 If nothing else, however, this demonstrates a casual conversational way in which a local journalist might be able to use slack as part of a local data beat to run regular, periodic checks over recent reports published by the CQC relating to local care establishments. Next Next post: Even Though RSS Never Went Away, Could It Be Coming Back as a Facebook Sinker?